Some of you might recall my lecture at our December, 2016 appreciation event where I discussed the idea of “good” Trump, “bad” Trump, just before he took office. That is, the idea that some of Trump’s proposed policies would likely be good for the economy and other policies would likely be bad, according to most economists like myself. In the end, it was the net overall degree of “good” vs. “bad” Trump that would determine the destiny of the financial markets. Last year, financial markets bet on net for the “good” economic policies (e.g., tax reduction and infrastructure investment) and against the “bad policies” (e.g., trade tariffs and limiting immigration). In this commentary, I focus on the two most salient “good” and “bad” policies that have dominated financial market stories this first quarter, and how we can best respond to them. Some argue that the new tax law is the largest tax overhaul since the Reagan era. As such, it is quite complicated and minimizing one’s taxes is in many situations not trivial, which is why it is important that many of us work with a sophisticated tax professional. In this commentary, I mention three ways we can lower our taxes under the current law, as well as analyze the trade tariff situation. First, many of our clients are philanthropically inclined. At the same time, many also face a minimum IRA distribution. When these two facts are present, a potentially helpful strategy is to engage in a Qualified Charitable Distribution (QCD). A QCD is a strategy that takes some portion (or all) of one’s minimum distribution and gives it directly to charity. When doing so, one’s income tax is reduced by the amount of the QCD. contribute $15,000 of charitable contributions they will receive no tax break versus if they had given nothing because their standard deduction is increased to $26,500.2 However, if instead the couple gives $15,000 to charity through a QCD, their income is reduced by $15,000. This amounts to an additional tax savings (Federal and State combined) of $6,750 per annum, assuming a combined rate of 45%. Assuming the same annual contributions, over 8 years (i.e., the new tax law is largely set to sunset in 8 years, at the end of 2025) this will mean an additional $54,000 of tax savings. Second, a related strategy due to the larger standard deduction is to “bunch” deductions. Continuing with the charitable donation example, let us assume a couple donates $15,000 per annum to charity and only has $10,000 of other itemized deductions. One strategy would be to transfer 8 years worth of contributions, or $120,000,3 to a donor advised fund. This means that this year just over $46,000 of tax savings would be realized compare to if one simply donated each year, assuming a 45% combined tax rate. In addition, Omega can help manage the donor-advised fund to potentially increase the cumulative value of donations made from the fund over time. Third, the miscellaneous itemized deduction, which is how taxpayers deduct accounting and investment advisory fees, has been eliminated under the new tax law. Meanwhile, many of our clients have real estate investments or businesses that they are involved in. With our Optimized Wealth Integration® approach, we typically advise in depth on both real estate and business planning issues. Fortunately, we also have a state-of-the-art billing system which allows us to bill clients in a customized way. In particular, rather than only offering asset-based billing, we can bill plan fees for real estate-related advice and also investment-based fees for investment fund advice. For example, assume a client is paying $40,000 per annum in asset based fees and also has a substantial real estate portfolio (and/ or business with planning needs). If half of the planning is based on real estate (and/or business consulting), $20,000 per annum could be carved out as a real estate (and/or business) consulting bill and $20,000 continued to be billed on the investment account as investment-based fee. Under the current tax law, assuming a 45% combined tax rate, this would save $72,000 in taxes over the next 8 years until the current tax bill sunsets. In sum, being strategic with the new tax law can mean a substantial decrease in tax liability over time. If you would like to further discuss some of these strategies, do not hesitate to call. Alternatively, this can be reviewed at your next visit. Meanwhile, we are continuing to research additional opportunities, as well. Finally, we will, of course, coordinate our planning strategies with your tax professional. While, on whole, the new tax law will help many, and thus the stock market dramatically increased in value due to its passage, the prospect of trade tariffs has had an adverse effect on market values. Indeed, most economists, including myself, would argue trade tariffs in general are a negative, as increasing global trade frictions can hurt all economies involved. Trump has threatened trade tariffs on about $150 billion of goods against China. In retaliation, China has threatened tariffs against the US on about $50 billion of goods. With tariffs, we can estimate an upper bound of the potential economic cost, since not more can be taxed than what is purchased. This means China could add taxes on an additional $50 billion of goods (i.e., up to the total of $100 billion of goods purchased by Chinese consumers and businesses) and the US could add tariffs on another $350 billion of goods (i.e., up to the $500 billion of Chinese goods purchased by the US). Thus, the US does have a much bigger stick than China on this issue. However, China could retaliate in other ways, such as limiting US company access to its markets or unloading its US Treasury Bonds, putting upward pressure on interest rates. 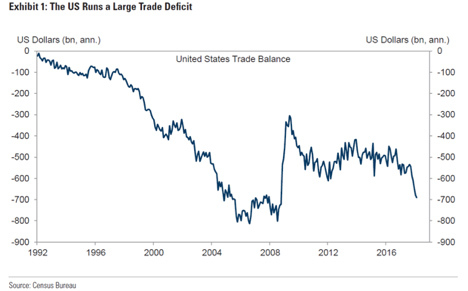 Nonetheless, Goldman Sach’s macroeconomic model shows that if all the currently threatened trade tariffs and retaliations were implemented, this might cost .1% of US GDP. For context, the OECD forecasts (before trade tariffs) 2018 US real GDP to be 2.54%. My forecast (before tariffs) is even a bit greater at 2.7%. In my view, a trade compromise and not full trade tariff implementation with China is also the most likely outcome. Thus, on whole, it seems financial markets have over-reacted to the notion of a US-China trade war. However, there can still be a significant reallocation of fortunes. Indeed, US steel companies have experienced a substantial increase in value, as tariffs are aimed to protect them. Meanwhile companies that supply substantial goods to China (e.g., Boeing and Caterpillar) have faced falling valuations. In the end, Trump is unpredictable, as well as China. This is part of why, in my view, we have experienced such a jump in volatility: markets swing back and forth between believing Trump will do this or Trump will do that, as well as guessing China will do this or that. Our prescription at Omega is as follows: rather than trying to predict what Trump might tweet (or do) next, let us make sure that we have partitioned your portfolio to survive if not thrive in different kinds of economic outcomes. Our proprietary States of the World® approach helps us to not rely too heavily on any particular economic outcome. And we continue to explore additional ways to do this, as well. In the meantime, as always, should you have any questions or concerns, please do not hesitate to write or call us. Note that now state and property taxes are now capped at a total of $10,000. The standard deduction for married couples filing joint returns is $24,000 for 2018. However, over age 65 persons receive another $1,250 of standard deduction, bringing the total to $26,500. For a single taxpayer over age 65, the standard deduction for 2018 is $13,250. The maximum charitable deduction for cash was raised to 60% from 50% of AGI with the new tax law. Thus, this example would require $200,000 of AGI to realize the savings in a single year.